I made three shirts using the same pattern. This was the first one I made. It looks cute with a pair of skinny jeans, I wish I had a photo of me wearing it! Aspects of the pattern frustrated me and didn't fit quite right, so I adapted it the second time I made it, and made a shirt for mom. Then I adapted it again, giving it a boatneck instead, and made another shirt for mom. I don't often make the same pattern multiple times, but it's a good practice. The shirt definitely got better each time I made it. I also made 8 simple chair covers to slide onto the backs of the chairs we have at the learning center. These little metal chairs we have are great for the kids, except that they often get bumped into the wall and leave marks. The chair covers will help protect my walls. + I really don't like our grocery store. I just don't. The aisles are inexplicably sticky, they are often completely out of sugar or cinnamon sticks or tortillas or beans or whatever random food item I really need...just happens to be completely out of stock whenever I need it. Unpackaged meat and fish is lying on ice in the open air in the middle of the produce section. The fruits and vegetables are of very dubious quality (usually we buy our fresh produce from the wet market instead). You have to bag your own groceries in your own bags that you bring (Which reminds me of Aldi's, except for the low prices and speedy checkout service). I don't like the grocery store, but it is a necessity, and I'm glad it exists, and I'm glad I can get the food I need to make dinner for my family. Well, the grocery store just added coin-unlocking mechanisms to their carts, which don't work unless you have the smaller 50 cent coin on you (there are two different 50 cent coins). Odds are, you will probably have to go to a cashier to change out some other coins for that small 50 cent piece before you can get a cart. And now I dislike grocery shopping even more. My feelings about this may be unreasonable. Maybe this was a reasonable thing for them to do, maybe not. An employee told us that they did it to prevent people from stealing the grocery carts, which I don't think could be true, because 50 cents sounds like a good deal for a shopping cart if you really wanted one of your own and had no moral objections to theft. Maybe my growing dislike of the grocery store is only partially based on reason, but every once in a while I daydream about not-sticky Meijer's aisles with delicious snacks like Skinny Pop White Cheddar Popcorn and kiwis that aren't rotten. + Another grocery shopping story. I was shopping with Cyrus in the carrier, which threw me a little off-balance, and as I put a carton of milk in the cart, I slipped slightly and ended up dropping the milk on my eggs. And then I had a box of broken eggs. So I went back to the egg section, got another, unbroken, box of eggs, and proceeded to the checkout, where I bought both boxes. The cashier was very skeptical about my purchase of the box of broken eggs, which was dripping goo by this point, but I tried my best to explain to her that it was my fault, I'd broken the eggs myself, so I wanted to buy them, but I didn't want to actually take them home. I wasn't communicating quite right, but I ended up being allowed to purchase the box, then dumped it in the trash can right outside the grocery store as soon as I got out so that I wouldn't continue to have raw egg dripping on the rest of my purchases. 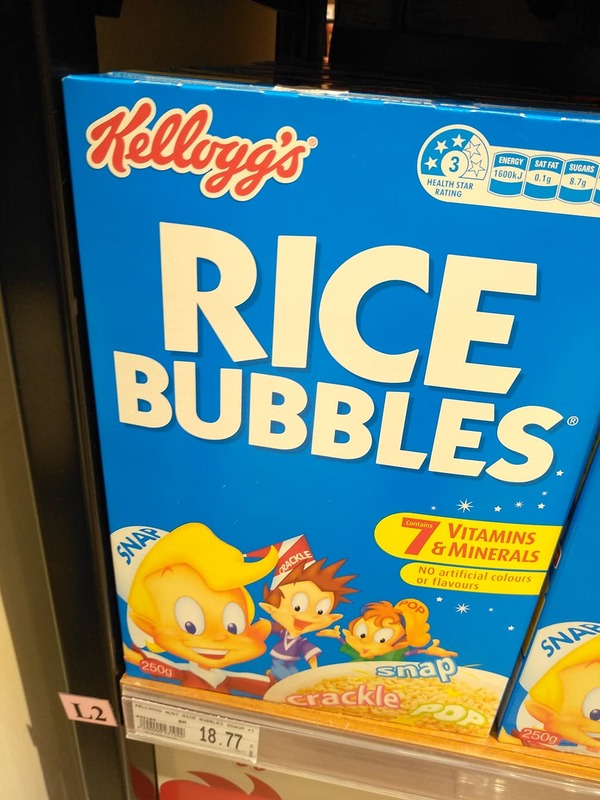 + Another grocery shopping story (can you tell what I do with my life): I discovered that rice krispies are called "rice bubbles" in Australia. Who knew? I mean, other than all of Australia. 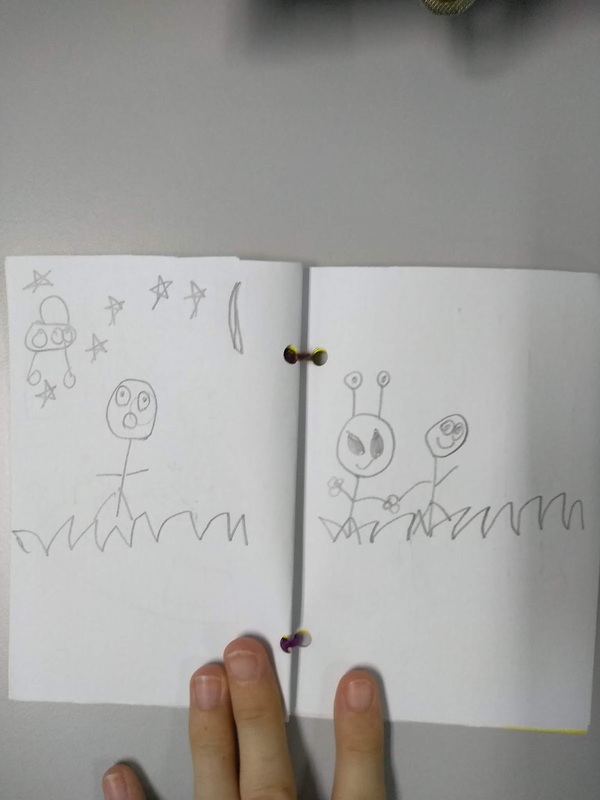 + Our educational creative activity of the day earlier this week was to bind a little paper book with yarn and then write and illustrate an original story. We had read a book earlier about L.M. Montgomery, and her desire to be an author, so I wanted to give them their own author experience. This was so fun. After they finished their stories, each student did a reading or presentation of their story to the rest of the class. The stories ranged from the tale of a cat who went shopping at the mall, to a mermaid who fell in love, to a prehistoric creature who went extinct. But my favorite story was one about an alien sighting, in which the boy and and alien end up becoming best friends, before the alien had to leave and go back to the star where he lived. +Sometimes I wonder why I love Angel so much, and then he asks my dad out on a father-son date in the weirdest way possible, and I find myself literally rolling on the floor, crying from laughing too hard, and I remember why. It went something like dad asking the family, "Hey, should I order pizza?" and the family saying "Yeah!" and then Angel saying, "Wait, Dad, do you want to go out for dinner with me tonight or tomorrow night?" Everyone looked at each other in confusion. Angel said, "Hey, the girls always get to go out with Mom for coffee and stuff, why can't I go out with Dad?" He had a point, and I think they had a fun time on their burger outing, but it was just so unexpected and random that it was startlingly amusing at the time. + Cyus is up to a total of 3 busted lips and a chipped front tooth. And I'm still hoping these are just flukes and that he isn't a rough and tumble little boy who is going to give his mother too many heart-attacks. His most recent, and worst, bloody lip happened while I was literally sitting next to him playing with him. He was standing next to a chair and wanted to pull some loose threads on the cushion (this chair has seen better days). I put my hand on the cushion and said "No," and he turned away really quickly and went down to the floor--I think he was planning to crawl away, but instead hit the tile floor with his face because he was moving too quickly. There was blood on his shirt, my shirt, the floor, and this happened about 5 minutes before Angel walked in the door from work. So I'm sure that was a peaceful arrival home. Or not. I guess this is the reality of a little boy who loves to move fast and lives in a world where everything is tile instead of carpet. I'm very cautious but he has not yet discovered caution. What stories has your year begun with? In the larger grocery chains here you have to bring your own bags to the grocery. They also have both reusable and plastic bags at checkout which you can purchase, but the aim is for everyone in the country to stop using plastic bags so you either walk with one or pay a price. I actually dont mind it from an environmental standpoint and its actually this way in lots of groceries in Europe and Australia as well. They do bag the groceries for us thought... unless its the fast line. ahhh the baby chipped tooth. So sad. I feel like we could very well be in for the same wild ride. Scott says that Wells likes to "destroy things" and he really does. His favorite is paper and he got two paper cuts the other day. That sounds like my grocery story nightmare. Ugh. Too funny about the Rice Bubbles but it doesn't really surprise me as they have different weird names for everything in Australia. That grocery store sounds terrible. No wonder you hate shopping there. I need to think about that the next time I feel my grocery store isn't well stocked. "50 cents sounds like a good deal for a shopping cart if you really wanted one of your own" - haha! I've never thought of it like that, but I'm guessing the real reason they do this is so people will actually return the shopping carts to their proper place and the store won't have to pay someone (like Walmart does) solely to collect carts. about halfway through our time in London, grocery stores started charging people for plastic bags and I couldn't clap my hands hard enough. We've been using our own reusable bags for the past 15 years and it thrilled me to no end when I started seeing more people do the same in London after the new charges were implemented. I wish more countries would catch on and do the same. Wait, what is the logic in having two different 50-cent coins? That is so odd. hahaha, rice bubbles! I never knew they were called that over there either, but it's a pretty cute name! I hope Cyrus calms down a bit! Busted lips and chipped teeth aren't ever fun (although I guess at least it's a baby tooth..)! What Level of Winter are You?